BIRMINGHAM, Ala. — The distance events at the 2019 NCAA Indoor Championships kicked off with the men’s and women’s miles, and both events largely went to form as the top seven seeds made the final for both genders. The two athletes with NCAA titles, Wisconsin’s Ollie Hoare and Samford’s Karisa Nelson, both looked strong, as did Arizona State’s William Paulson, who won heat 2 on the men’s side with the fastest time of the day in 4:06.57. 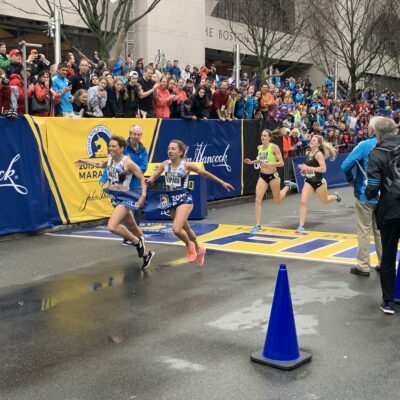 The main drama came in heat 1 of the women’s mile, where the #8 seed, Oregon’s Susan Ejore, fell down and Providence’s Millie Paladino followed suit. Ultimately, Paladino was advanced under protest (Ejore was not), making an 11-person final. Boise State’s Alexis Fuller led the women’s qualifiers in 4:36.27 after winning heat 1. In the 800 semis, there was a little more drama as the #5 and #6 seeds in the women’s 800 and #6 seed in the men’s 800 all failed to move on. Additionally, two people that were expected to contend for the title, Danae Rivers of Penn State for the women and Marco Arop of Mississippi State for the men, only made the final on time. The men’s mile went almost exactly according to form as the top nine seeds all made the final, with Ole Miss’ Derek Gutierrez (12th seed) nabbing the final spot in favor of #10 seed Reed Brown of Oregon. The first heat went out extremely slowly, with the field passing 809 meters in 2:14, before Texas’ Sam Worley seized the lead with 600 meters and controlled the race from that point forward, closing in 53.84 for his final 400 to win it in 4:09.20. With the top four in each heat earning spots in the 10-man final, the two time qualifiers were up for grabs in heat 2, and though that race went out slowly as well (2:12), it was fast enough to ensure that the top six all made the final. NCAA 1500 champ Ollie Hoare qualified comfortably in second, but the heat win went to former Princeton runner Will Paulson, now a 5th-year grad student at Arizona State. Paulson, a 24-year-old Brit and the 2018 Heps 1500 champ at Princeton, made NCAA outdoors twice as a Tiger, but neither went well for him; in 2017 he tore his soleus and was forced to drop out whereas last year he missed out on the final time qualifier by .08. So understandably, Paulson said that he was “over the moon” to make his first NCAA final today. Paulson said the difference between the last two years and 2019 is that the academics aren’t as demanding at Arizona State — where he lives with another Heps champion from Princeton, Garrett O’Toole (nephew of Dallas Cowboys coach Jason Garrett), who is also doing his 5th year in Tempe. That’s allowed him more time to sleep and recover better. Plus he’s so far been able to resist the siren’s call of going out too much at a school famous for partying. “[Resisting the urge to go out] can be hard I guess sometimes, but it’s been really great, just being able to focus on the running,” Paulson said. 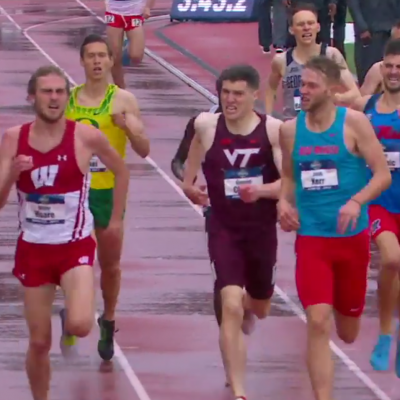 Worley was the one who finally got the pace going in heat 1, and it’s probably not a move he would have made last year, when he entered the meet as a self-described “timid freshman” simply hoping to finish in the top 8. Though he did pretty well for himself in his first year, making NCAAs in the mile (but failing to advance) before finishing 5th in the 1500 outdoors (he’s the top returner), this time he’s shooting for the podium and, ideally, the win, and ran like it today. When was the last time someone ran 4:06 in the mile at NCAAs and PR’d in the race? Given that it took 3:59.36 just to qualify for the meet, we’d imagine it’s been quite some time. 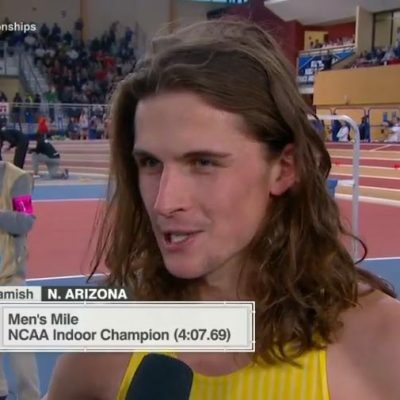 But NAU’s Geordie Beamish, who qualified with a 4:06.96 at altitude on a flat track in Flagstaff, had his time converted all the way down to 3:57.99 for qualifying purposes and shaved .02 of a second off that time today to make the final. Though this event looked wide-open coming into the meet, the top seeds largely took care of business; the top seven seeds all made it, with #8 Susan Ejore of Oregon only missing out after falling in heat 1. Providence’s Millie Paladino, who was caught up in the fall and went down as well, ended up advancing to the final after a protest, but Ejore was not advanced along with her. Two years ago, no one was more shocked than Karisa Nelson when she won the NCAA mile title after entering the meet as the 12th seed. After that, she finished 3rd in the 1500 outdoors, but in January 2018 she broke her foot falling down the stairs and missed six months of running as a result. When she finally returned to running in August, she said she could barely run 1k repeats at 6:00/mile pace. But after a slow buildup, she got herself back into shape and truly announced her return with a 4:34 mile at the Dr. Sander Invite on January 26 — just three seconds off the PR she set to win NCAAs in 2017. “If I had known I would be here right now a year ago, I would be ecstatic, because it was just such a long, hard journey,” Nelson said. In fact, Nelson said that she believes she’s in even better shape than she was two years ago. Nelson will be the hometown favorite. She’s an Alabama native, and Samford’s campus is just 20 minutes from the CrossPlex, and after the race she had plenty of friends screaming at her from the stands. We imagine they’ll be even louder tomorrow. The women’s 800 heats had a little bit of drama as NCAA 1000-meter record holder Danae Rivers of Penn State, the favorite of the LetsRun.com nation for the title (44% picked her to win in our poll), only advanced to the final on time as she faded from second to fourth at the end of the first heat. Also there were a few casualties as the #5 and #6 seeds on the year in Marleena Eubanks of Kansas and Abike Egbeniyi of Middle Tennesse State, who had both run 2:03 on the year, failed to make the final. #1 seed Martha Bissah of Norfolk State and Ghana looked good in winning heat #1 after NCAA record holder Jazmine Fray led it for the first 700. In heat #1, UConn senior Susan Aneno led from start to finish and got the win in the fastest time of the day. Rivers ran 4:29 in the mile this year, the fastest time in the country, but elected to run the 800 at NCAAs instead, where she was seeded third at 2:02.94, saying that she had “more confidence” in the 800 since she has raced it more this season (though she only ran two 800 finals — including a win at Big 10s) compared to one in the mile). As for only making the final on time, Rivers said she was “a little bit” worried but is just glad race #1 is out of the way. In the men’s 800 semis, the top 5 seeds all moved on the final but Canadian champ Marco Arop, the #2 seed, only did so on time as after gapping the field at the start of the final lap, he faded big-time over the final 100 in heat #1. Kansas’ Bryce Hoppel, who hasn’t lost an 800 all year, looked the best of anyone as he won the heat in the fastest time of the day in 1:48.30 (the top 5 were pretty close however, as Arop was 5th in 1:48.66). Collegiate record holder Devin Dixon won heat two in 1:49.15 with the big news being that neither of the two Texas Tech runners advanced to the final, damaging Tech’s team title hopes. Dixon went wire-to-wire in heat 2 and said he will try to do the same thing tomorrow, just faster. “I feel like there will be a collegiate record [in the final],” said Dixon, whose 1:45.27 from earlier in the season is #3 on the NCAA all-time list, behind Paul Ereng’s 30-year-old collegiate record of 1:44.84. “If I stay back and get caught up in the crowd, as tall as I am, you can see, I can’t keep track of my legs,” Dixon said. We also asked Dixon why Alleyne Francique — the mid-distance coach at Texas A&M until February 2018 — was fired in the middle of last season for reasons that still have not been made public. Dixon said he “couldn’t go into detail” but said that Francique “had different ideas and different plans, so he wanted to follow his dream, so we let him.” We asked why Francique left in the middle of last season, and if Dixon knows, he wasn’t telling. “I don’t know what to tell you,” Dixon said. Arop made a big move on the third lap, dropping a 27.39, and led by .68 of a second at the bell. But just as at SECs, where he made a similar move but wound up fading and finishing second, he ran out of gas on the final lap, running it in 29.36 to fade from first to fifth, relying on a time qualifier to make the final. Arop said that he usually makes a big move just after halfway, something he began doing after watching David Rudisha destroy his opponents over the final 300 meters of races. Arop — who came in seeded at 1:45.90, good for 7th on the all-time collegiate indoor list — acknowledged that it hasn’t worked in his last two races, but was ambivalent as to whether he would try something different in tomorrow’s final. “I gotta think of something, because that hasn’t been working for me in the past, but if it has to, I think I’ll do the same thing again in the final,” Arop said. Results appear below. Heat by heat results here. Talk about the action on our world famous fan forum / messageboard. MB: Official 2019 NCAA Indoor Day 1 Discussion Thread.